Francis was born at St Arnaud, VIC in 1889 to Francis Harbottle Crook - whose father was James Elijah Crook(1) - and Hannah Eliza McCausland. Francis had three brothers, Charles, Cecil and James, who are also remembered in the Avenue. Francis married Estelle Tribolet in 1914 and they had at least three children, Francis born in Bacchus Marsh in 1915, Marcelle born in Bacchus Marsh in 1919 and Betty born in Seymour in 1920. National Bank of Australasia Limited. Francis was a bank clerk with the National Bank of Australia and gave his address as Bacchus Marsh, VIC when he enlisted in the AIF on the 28th of August 1914 - shortly after war was declared - aged 25. He embarked aboard the HMAT A21 Marere in October with the 2nd Field Artillery Brigade Ammunition Column. After disembarking in Egypt he joined the Mediterranean Expeditionary Forces and landed at Gallipoli - near Gaba Tepe - on the 25th of April 1915. 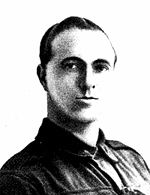 In September he was admitted to hospital in Egypt for two weeks - it is not known if he returned to Gallipoli. Francis was made an acting Bombardier in November. He was hospitalised in December with Mumps and then again in January 1916 with Haemorrhoids - discharged to duty at the end of February. He was promoted to Bombardier in March and embarked for France. After disembarking at Marseilles, France in late March 1916 he transferred to the 21st Field Artillery Brigade in May. In October Francis was wounded in the arm and shoulder.He was promoted to acting Corporal in November, then Corporal. He transferred to the 1st Field Artillery Brigade, 3rd Battery, in January 1917 and by July was a temporary Sergeant. In October he was promoted to Sergeant and shortly after wounded in action in Belgium - admitted to hospital with a gunshot wound to the right foot and gas burns to the hands and legs, severe. In November 1917 Francis was evacuated back to hospital in England and in April 1918 embarked for Australia aboard the A30 Borda. He returned to Australia at the end of May(2) and was discharged from the AIF in December. Francis Crook died at Sandringham, VIC, in 1973, aged 84.